GOYANG, South Korea, Sept. 21 (Yonhap) — The stars of the popular TV series “Jealousy Incarnate” said Wednesday they’ve been struggling to keep themselves from laughing during the many funny moments on the show. The rom-com drama starring Gong Hyo-jin, Jo Jung-suk and Go Kyung-pyo has been climbing TV charts since its first broadcast on Aug. 24, with the latest episode recording a viewership of more than 10 percent. It tells the story of a macho news anchor (Jo) who begins to develop feelings of jealousy in a love triangle with his secret admirer and weathercaster Pyo Na-ri (Gong), and his close friend and chaebol heir Go Jung-won (Go). 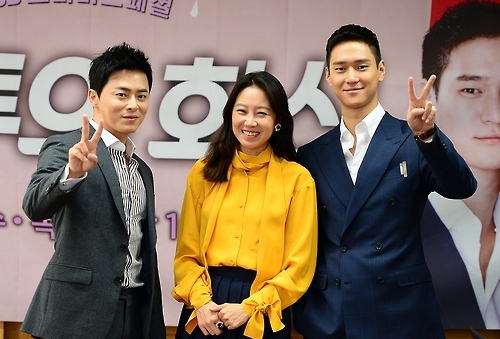 Jo Jung-suk (L), Gong Hyo-jin (C) and Go Kyung-pyo pose for a photo during a press conference promoting their drama “Jealousy Incarnate” at an SBS TV station in Goyang, northwest of Seoul, on Sept. 21, 2016, in this photo provided by SBS. The 36-year-old explained that the facial expressions that come from concentrating harder sometimes fit the situation really well and probably appeal to the viewers, too. One of the funniest scenes was when Jo had a double nose bleed inside an elevator, she said. Jo, who recently acted a scene where he underwent a test for breast cancer, confessed to having similar problems with laughter, although he added that it has made filming all the more fun. “I think we’re a group of people who know exactly what a comedy should be like,” he said. The cancer screening itself was no laughing matter, though, as it “really hurt,” according to the 36-year-old. After watching the drama, one male viewer went to the hospital for a checkup and was diagnosed with the cancer that is rare in men. The actor asked viewers to stay tuned to see how badly jealousy ruins him and whether he succeeds in love. Go said he, too, will likely be ruined by jealousy but in a different way from Jo. The 24-part series airs every Wednesday and Thursday at 10 p.m. on SBS TV. A poster for the SBS TV series “Jealousy Incarnate,” provided by SBS.